Mission: Augusta Age-Friendly is a committee of community members devoted to making Augusta, Maine a livable community for ALL AGES; supporting healthy aging in various ways, partnering with community organizations to enhance existing services, and encouraging volunteerism and active citizen participation in the social, economic, and civic life of Augusta. Vision: Dedicated to making Augusta a CAPITOL OPPORTUNITY for living, working, and playing; for all ages! Educate the public on existing social opportunities available; particularly those at low- to no-cost. Continue developing partnerships with other entities that align with or share any of our missions, goals, and purpose. 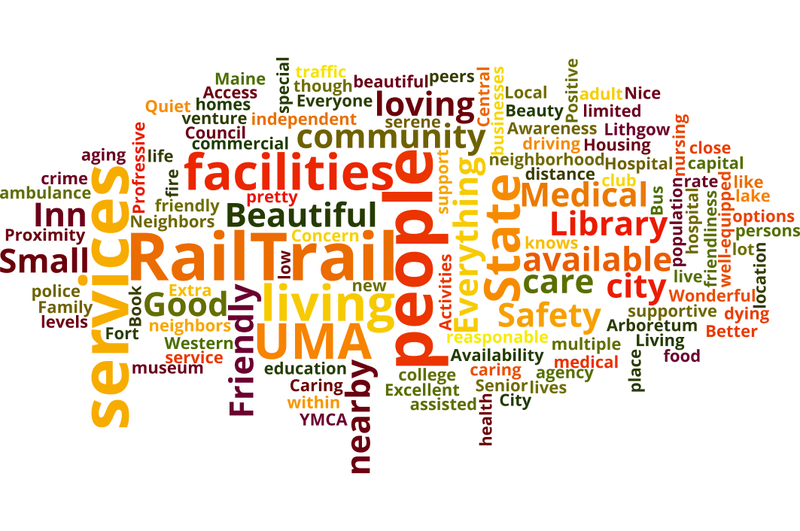 Augusta is a full-service city; Spectrum Generations provides many services in the community, including Meals on Wheels; and Kennebec Valley CAP provides transportation services with the Kennebec Explorer and our new Senior Transit Program. The city has several senior housing complexes and a compact walkable downtown. Most recently, the Buker Community Center has dedicated space for senior programming and activities at no cost to participants. We continue working across the eight domains of livability to build on existing services, policy and infrastructure to increase the age friendliness of Augusta. Through continued conversations with experts on aging including our residents, service providers, city councilors, and first responders we continue to work on identifying how the community can fully and more effectively meet the needs of an aging population. We will continue sharing this information with the City and other service providers who are already providing many services and will consider whether new volunteer initiatives are needed. We hope to be able to put community resources in place through a coordination of current resources, implementing the services currently not available and mobilization of volunteers eager to make a difference in their community to improve the functional status of older adults. Augusta Age Friendly Committee (AAFC) is directed by a city-appointed Age Friendly Committee. Subcommittees are developed to properly address the needs of existing programs, new projects, and volunteer recruitment. Although we have a core committee and subcommittees, we are always in need of new volunteers. Our first Action Plan, approved by AARP National, is nearing its expiration date, wherein we start the evaluation period to review accomplishments, set new goals, and examine areas in need of improvement. Then, the process of drafting a new action plan will begin to take place. Augusta Age Friendly continues to work with the City of Augusta and AARP Maine. 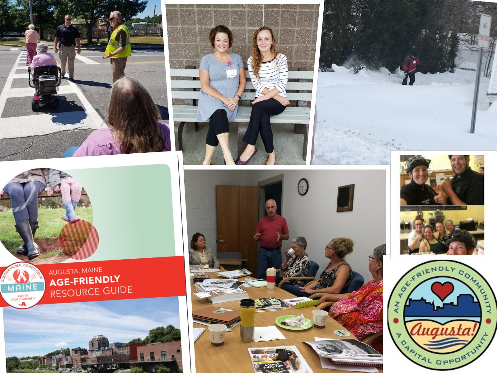 AAFC has formed many partnerships to work on projects such as the Lung Cancer Awareness Project, Benches program (Mill Park, Shaw’s & Hannaford’s Supermarkets, and Capitol Street), created a Resource Guide, and worked to provide educational and health classes at Buker Community Center. Showcase projects include our Sand Buckets for Seniors and Clear Paths & Connected Community Volunteer Shoveling programs – which are in their second years. 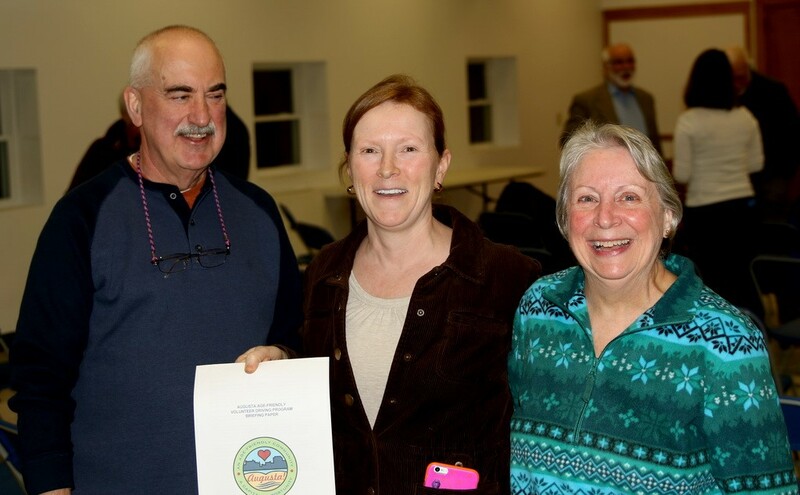 We continue to take steps to be included and involved in community events and will be actively participating in the Comprehensive Planning with the City of Augusta and providing input in the newly formed Regional Advisory Council with Spectrum Generations (Central Maine Area Agency on Aging). We have tabled for the last two years at both the Spectrum Generations’ Healthy Aging Expo and KV Chamber of Commerce’s Business Expo with great success! Pedestrian and Bicycle Safety has become a recent focus and there is much to be done to increase safety for pedestrians and cyclists in the Capitol City. Volunteers are the lynch-pin of our committee. Our amazing volunteers can assist the Augusta Age-Friendly Committee in many ways. The role of volunteers can be shaped upon a person's availability and desire to assist our committee in reaching goals listed in our Action Plan. Many other volunteers bring with them new and grand ideas that have helped our committee take on new and unforgettable projects. We are always looking for input from residents and employees in Augusta in striving to keep goals current, viable, and of great value to those working and living in the city. Strategies for success include: Consistent advocacy for age-friendly community development with elected officials and with key municipal staff. A successful partnership with AARP Maine. The commitment of committee members to achieve goals that improve livability for all people who reside, work, and play in the City of Augusta. Challenges currently lie within deciding to apply for 501c3 designation or finding and securing a fiscal agent/fiduciary sponsor – to be able to apply for funding opportunities and take on more projects. The AAFC started out by receiving a grant from AARP Maine to fund original initiative goals. Our benches project was possible with thanks to private and business donors. Currently, we work on projects that come at little to no cost to our committee. The AAFC offers a Senior Transit Program with KVCAP – a dedicated route (outside of Kennebec Explorer’s normal operating hours and routes) for the residents of nine senior housing developments to increase opportunities for social participation and decrease social isolation. 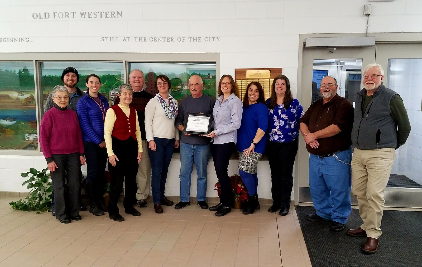 Augusta Age Friendly Committee has a successful Sand Buckets for Seniors Program that delivers five-gallon buckets of salted sand to residents with disabilities and those over the age of 60 to help with fall reduction. AAFC also has a successful Clear Paths & Connected Community volunteer shoveling program that, during the winter months, offers free shoveling to residents to clear walkways and paths to oil fill locations. AAFC is interested in compiling a list of contractors willing to make a list of low-cost services. We are interested in vetting other contractors to make referrals, when necessary. Augusta Age Friendly Committee AAFC is also looking into working with local Scout troops and the Kennebec County Jail to determine if they can assist with lawn clean-up projects. Augusta Age Friendly is working with the Augusta Masonic Bodies to explore the possibilities of a Home Repair and Modification Program where Masons will provide low-tiered services (changing light bulbs, replacing screen doors, simple weatherization tasks, and/or changing out window screens) and/or referrals for larger projects. We are also interested in working with the American Red Cross and the Augusta Fire Department to see that residents have working smoke detectors in their homes. Augusta Age Friendly is working in conjunction with the Augusta Recreational Department to provide Health and Wellness classes at little to no cost to participants at the Buker Community Center. Tai Chi, Matter of Balance, and Healthy Living Program trainings are being offered to committee members to increase availability of these courses in the capitol city! Augusta has many other opportunities available in our region, however, many residents are not aware of what is being offered. AAFC promotes locally offered Health & Wellness programs on our Facebook page. We also partner with organizations offering local Health & Wellness activities (5k’s, Marathons, Spectrum Generations’ Healthy Aging Expo, and MaineGeneral sponsored activities) – promoting them on our Facebook page and tabling whenever we are invited. Augusta Age Friendly has a Resource Guide that was published, courtesy of AARP Maine. It is available electronically at Augusta Age Friendly Resource Guide 2017. AAFC is also planning on working with Spectrum Generations and other age friendly communities to update the Aging in Place Service Provider Network and continuously work together to keep it updated. Augusta Age Friendly has partnered with the Augusta Recreational Department and is looking for social, educational, and recreational opportunities to be held at the Buker Community Center in the senior room. Augusta Age-Friendly promotes social, educational, and recreational opportunities offered in the Augusta Region on our Facebook page. We participate in various social, educational, and recreational activities to promote awareness of the Augusta Age-Friendly committee and initiative. Last winter Augusta Age Friendly participated in the Viles Arboretum for their annual winter table tours. This event allows participants to cross-country ski, snowshoe, or walk along the Outer Loop Trail and visit tables set up throughout the trail to get hot chocolate, try potluck dishes, and enjoy warm bonfires. Augusta Age Friendly has started a knitting club at the Buker Community Center. Knitters meet once a week to knit hats and mittens for kids in need at three Augusta elementary schools. In the past, we have also partnered with the Augusta Thrive Collation for movies in the park. 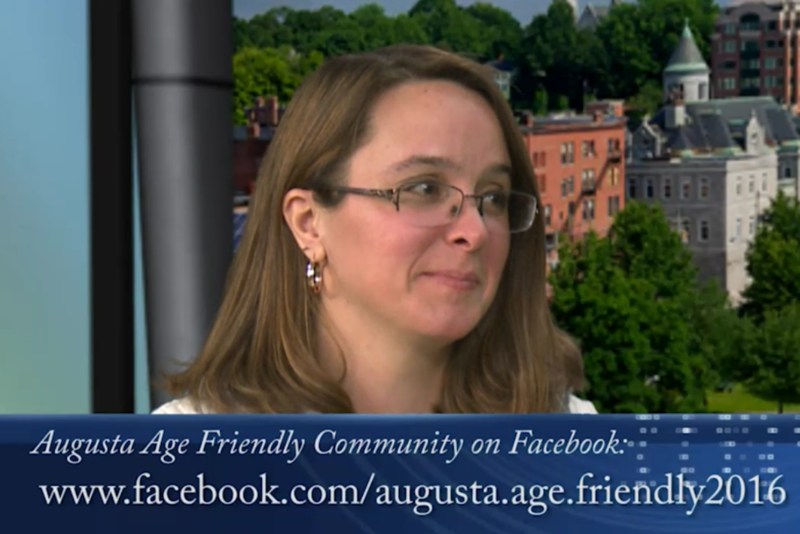 Augusta Age Friendly shares opportunities and information on Facebook and participates in local events, when possible. We also collect donations for the Augusta Food Bank and the local Boys and Girls Club at monthly meetings. We plan on seeking out additional opportunities to offer educational courses for gardening and cooking at Buker Community Center. Augusta Age Friendly share opportunities and information on Facebook and provide information to residents on local resources and services. We highlight services offered through Spectrum Generations as frequently as possible. We recently partnered with the Kinship Support Group and promote their monthly support group to kinship families we encounter. We are looking to find more ways to support kinship program to promote sustainability. Augusta Age Friendly is also connecting with the Family Violence Program and supports the work they do. We share AARP Fraud Watch information on Facebook, as well as information regarding the signs of elder abuse in an effort to raise awareness. 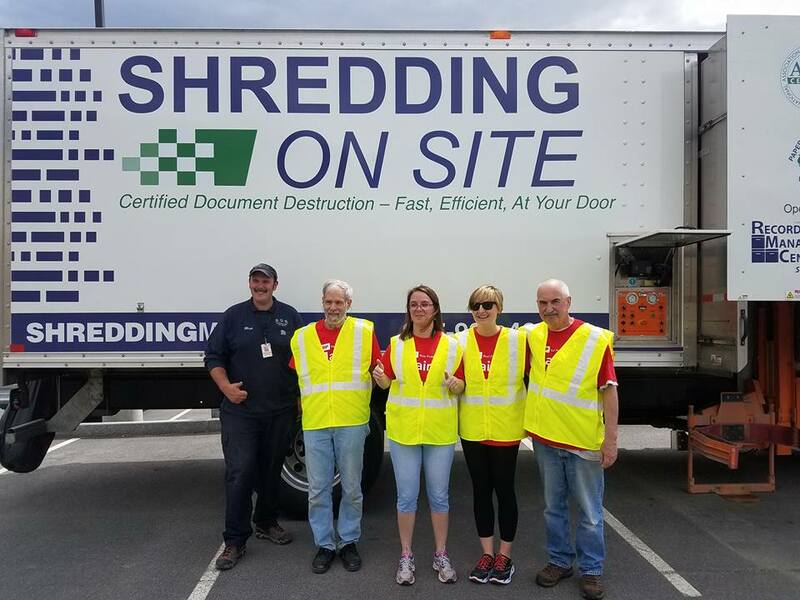 Augusta Age Friendly has organized two shredding events in partnership with AARP Maine and the Kennebec County Sheriff's Department and plans on doing a third next year. We also work to connect residents with AARP to enroll them in an email distribution list that sends out alerts about current scams. Our committee is currently represented at the Greater Augusta Elder Abuse Task Force. We continue to partner with various entities for the installation of benches and resting areas at key places within the city. Through our collaboration with Shaws, Hannaford, the University of Maine, Augusta, and the Eagle Scouts, we have installed at least ten benches within the community so far. We are working with the city to improve walkability. We work closely on projects that support the City of Augusta's Complete Streets Program, such as our beta pilot program for smartphone applications to improve walkability and accessibility. 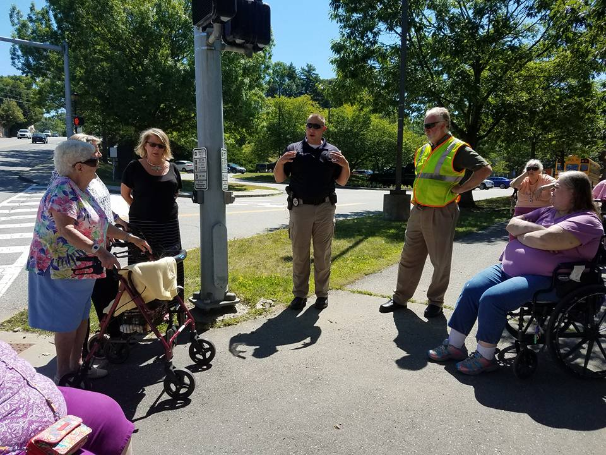 Augusta Age Friendly is currently working with the Augusta Police Department, Maine DOT and the Bicycle Collation of Maine to improve pedestrian and bicycle safety by offering pedestrian safety demonstration and safey forums throughout the capital region. Augusta Age Friendly maintains an active Facebook page with information of interest to Augusta-area residents. In the past we have had many opportunities to communicate with our community with over 10 newspaper articles published, active Facebook page, an Age Friendly sticker campaign, public discussions with numerous organizations around the city, three interviews with WABI, CCTV presentations to the council and the 1/2 hour "Mayor's Corner" show, a senior college forum at UMA on top of our survey, focus groups and public meeting. This high intensity communication across a variety of media has raised the level of awareness of age friendly in the community and moved us in a forward direction. We have also created business cards and buttons that we can hand out to individuals who want to join monthly meetings to obtain more information about what committee does. Developed an Augusta Age-Friendly Business/Organization Certification Guide, Checklist, and Application for local area businesses and organizations to become certified as Age-Friendly - qualification for this designation includes age-friendly actions such as including a wheelchair accessible entrance, easy-to-open or automatic doors, improving lighting, noise management, age-friendly oriented customer service, tips to improve communication skills with older adults, age-friendly marketing ideas, and age-friendly service options. We currently have at least four businesses and organizations signed up, and we continue to find others who are interested in being certified to become age-friendly.